Most companies have finally realized the importance of people wishing to travel in comfort without having bulky suitcases that are difficult to haul. Urban travel for all ages has finally arrived with adjustments for travel backpacks. Standard hiking bags and packs were the norms till companies realized the need of the hour to adapt to travelers of all ages. If you’re planning a trip with multiple locations, multi-city, or just someplace with longer days, then it would be ideal to choose a travel backpack that is durable, easy to carry, and comfortable. 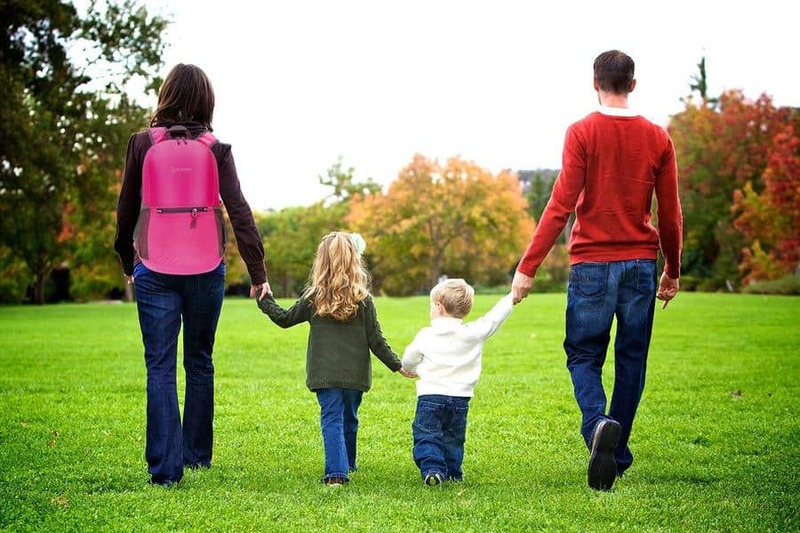 Travel backpacks protect the back from taking too much load and help you walk comfortably. This question is probably the most asked. Picking a travel backpack should not be an impulsive decision. It would help if you considered your needs and requirements before you narrow down your selections. Size: Always pick a size that you can carry comfortably. 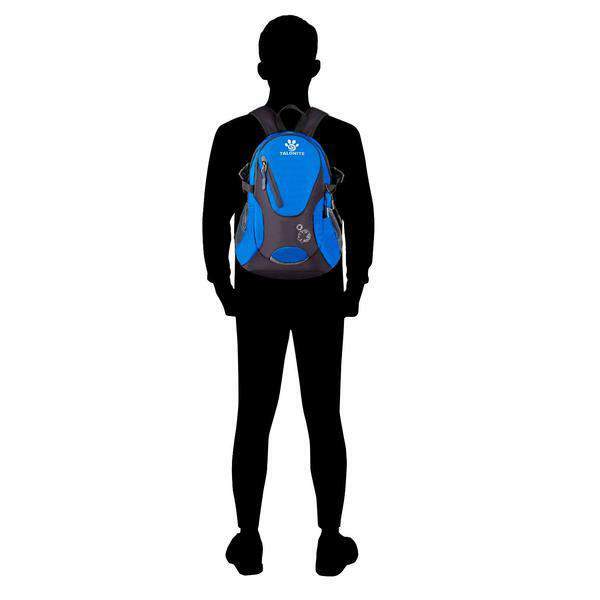 If you enjoy traveling to different places and prefer keeping your stuff with you, you should select a backpack size that rests comfortably against your back. Don’t blindly choose a size from the liters it holds; try it on and then make a choice. Straps: Straps are essential for distributing the weight of your belongings across your body as you walk and travel from one place to the next. Select padded shoulder and hip straps. You could also opt for one with a chest strap to evenly spread the weight between your shoulder blades. Frame: Internal and external frames matter during selection. Lightweight frames should be your choice instead of large external ones with poles sticking out. Material: Depending on your places of travel, choosing a travel backpack with water-resistant material would be the best course of action. Opt for lightweight materials that do not add excess weight to the pack. Our list below has been compiled keeping in mind that different people have different needs and requirements. We have personally tested each of these travel backpacks and have made comparisons by quality, material, and durability. The price points are in increasing order starting from the lowest to highest. 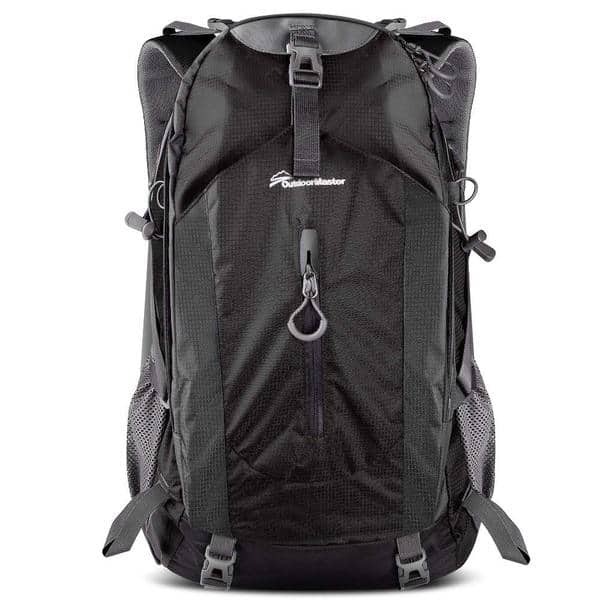 Our Premium Pick would be the Osprey Farpoint 40 although it does go head to head with the Osprey Unisex Porter 46. The sheer usability, efficiency, and durability of the backpack make it an excellent pick for travelers. Our Value Pick would be the Outlander Ultra Lightweight for its excellent features and competitive, yet inexpensive price. Easy on the pockets, with great deliverables, it is definitely a value for money type of backpack. The Best Choice, however, would go to the Teton Sports Scout 3400 for its excellent features like mesh back ventilation, lumbar support, capacity, and endurance. Perfectly priced, and not too expensive, the Teton Sports should be your first choice in travel backpacks. We are starting our list with the Zomake Ultra Lightweight backpack since its extraordinarily versatile. Inexpensive, the Zomake Ultra Lightweight its extremely durable. 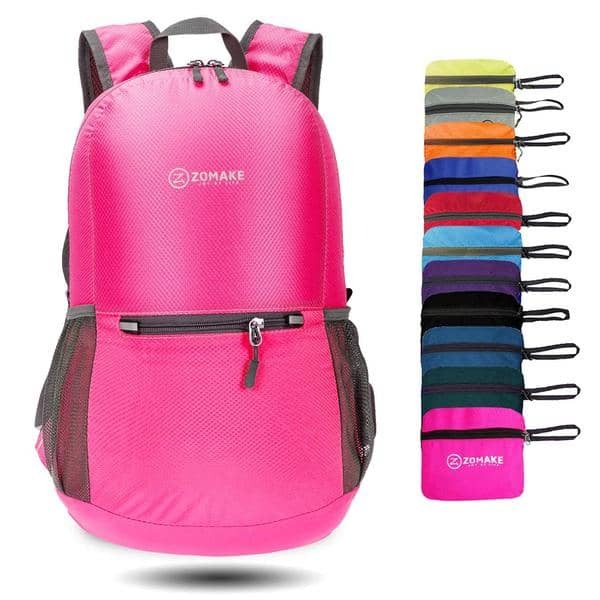 Easy to carry and transport, this travel backpack has multiple uses and comes in a variety of colors. Used as a day bag, and carry-on for long-haul flights, day trips on holidays, short hikes, camping, and so on, this bag is a winner. 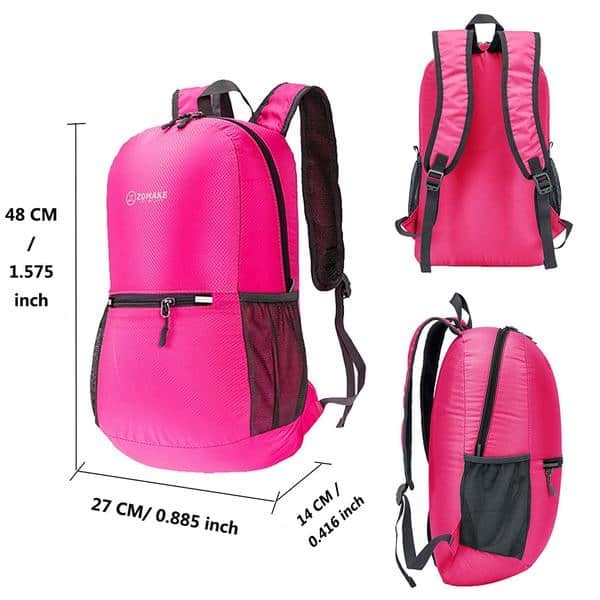 It has a 20-liter capacity and is made with tear-resistant nylon material. 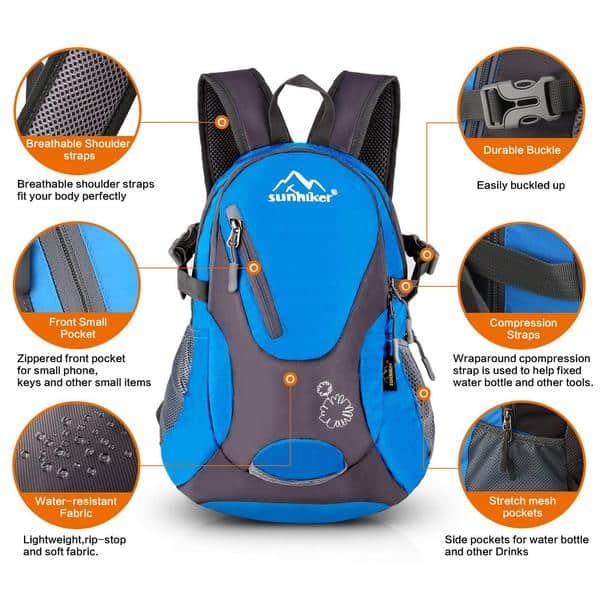 This travel backpack features one front zipper for small items and two mesh pockets on either side for quick access to things like cameras, water bottles, or guidebooks. It also has an internal zipper pocket to store larger items. The Zomake Ultra Lightweight comes with breathable, flexible mesh straps that are easy to lock. The stress points have bar tacking for longevity and reinforcement. Like the Zomake, the Outlander also has a water-resistant and durable travel pack for day use. Tear and rip-resistant, this ultra-lightweight backpack comes with a water-resistant nylon coating. 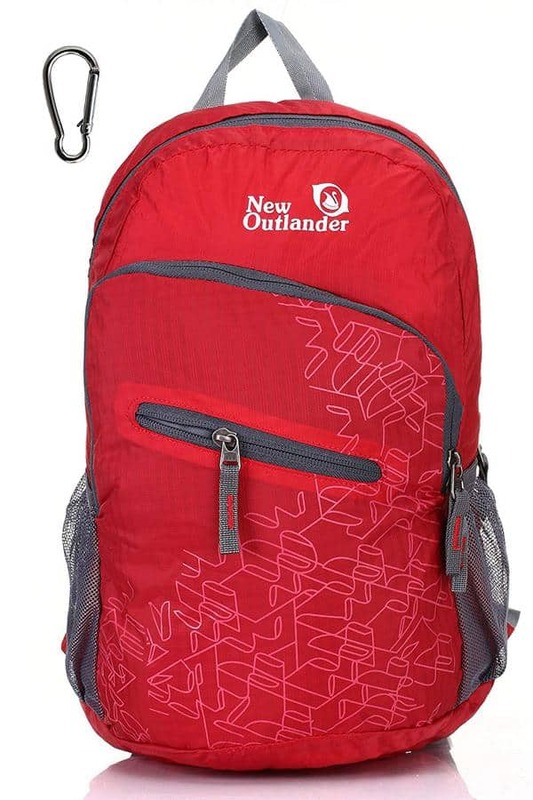 Outlander uses 2-way Abrasion Resistant SBS zippers to increase the locking and overall usability of the pack. The stress points are bar tacked to increase the longevity of the Outlander Ultra Lightweight. 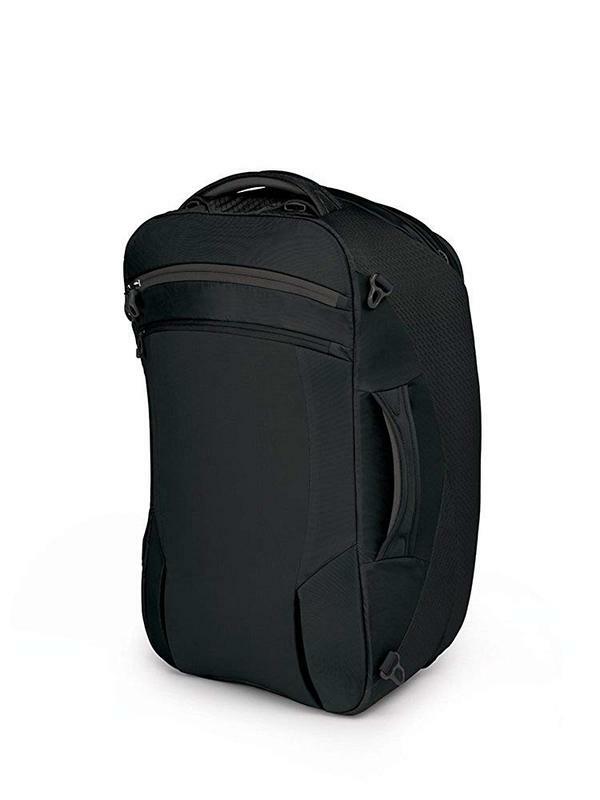 As the name suggests, this travel backpack is light weighing a mere 0.5 pounds and can store up to 33 liters of stuff. 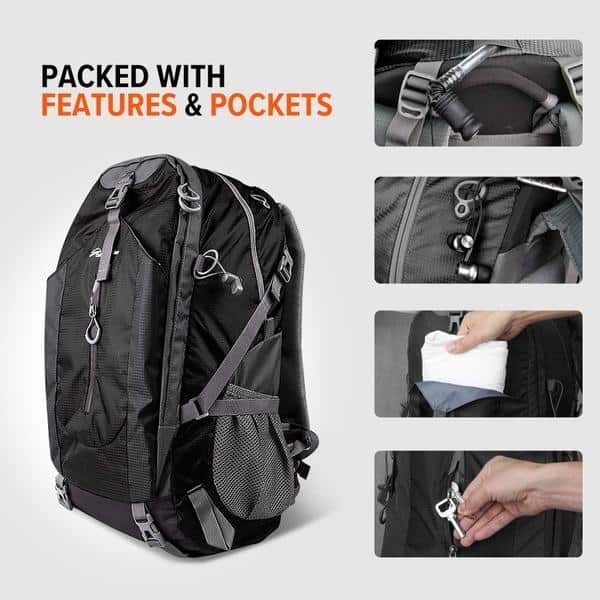 It comprises several roomy compartments, front and back zipper pockets, an internal zipper security compartment and two side mesh compartments on either side for ease of reach and access. It also includes a carabiner clip to attach things or to carry them more comfortably. Easy to move, the Outlander also has adjustable mesh straps that are breathable for extended wear with padding. As an added advantage, it comes with a lifetime manufacturers’ warranty. 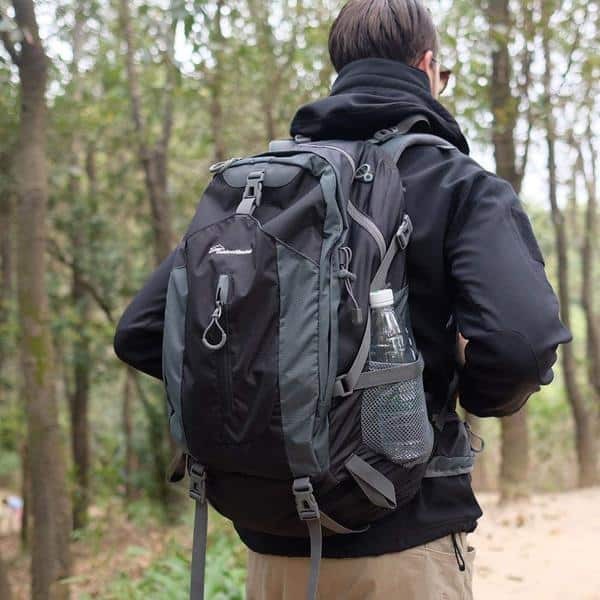 Like the prior two-day backpacks on our list, the travel backpack from Venture Pal is also extremely durable and versatile. Made from high-quality water resistant and tear proof material, this backpack is a lightweight dream at 0.7 pounds. 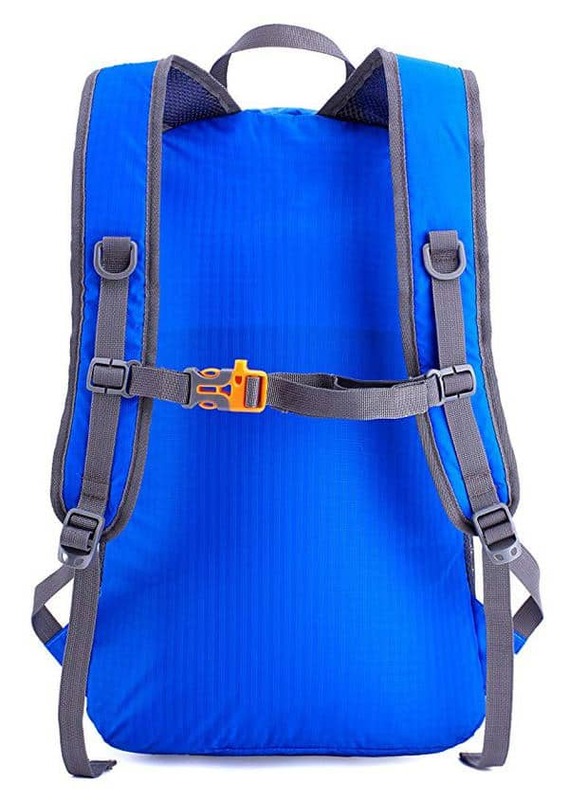 Easy to transport and fold away, you can take this hiking backpack anywhere you want. It can hold up to 35 liters so is known to be nice and roomy. You can also suitably organize your belongings as you pack. The interior has multiple compartments to make organizing and finding stuff easy. It has one main compartment, two side pockets, and two zipped pockets for ease of access. The main compartment also has two separators to make things easy. 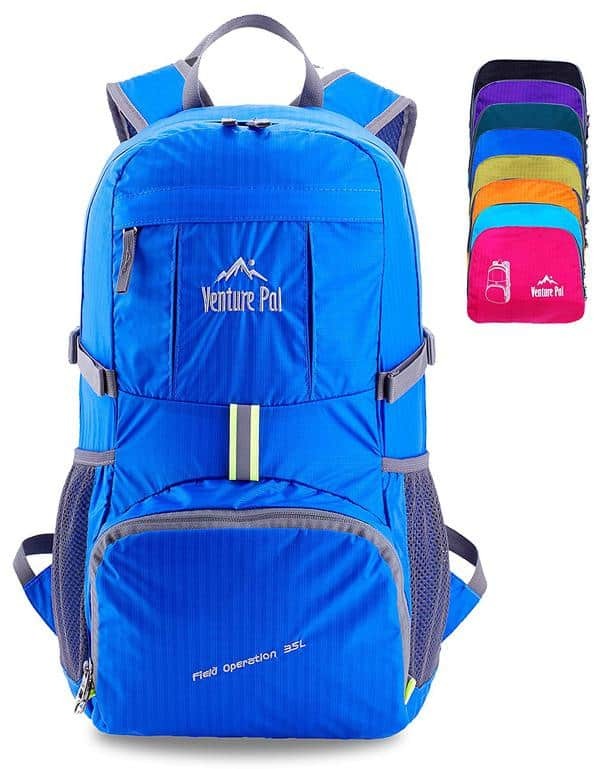 This backpack from Venture Pal comes with breathable mesh straps with plenty of sponge padding. It helps relieve the stress from shoulders with the help of an adjustable chest strap with a whistle buckle. The Sunhiker Daypack is a lightweight backpack that can be used in multiple ways. It doubles up as a storage bag or as a trekking backpack. Great for short trips, it can store foodstuff, clothes, numerous water bottles, books, cameras, and other essentials. 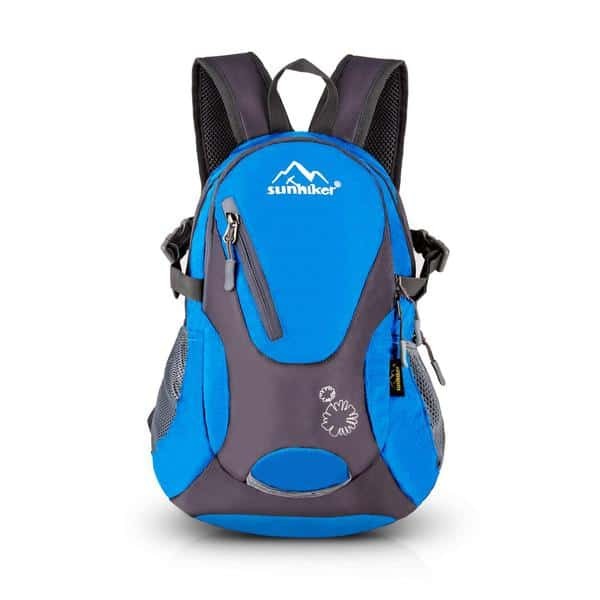 Water and tear-resistant, the Sunhiker Daypack is a favorite with users of all ages. It also comes in multiple colors. It has adjustable sternum straps to balance and evenly distribute weight throughout your shoulders. You can also adjust the breathable and well-padded shoulder straps with a D-hook as an attachment point. 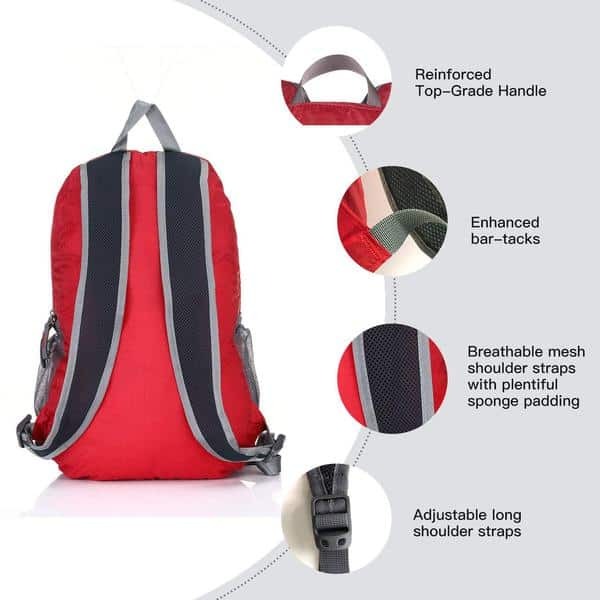 The added advantage to this backpack is the mesh back panel that allows your back to breathe even in hot and humid condition and doesn’t allow the skin to feel sticky or clammy. 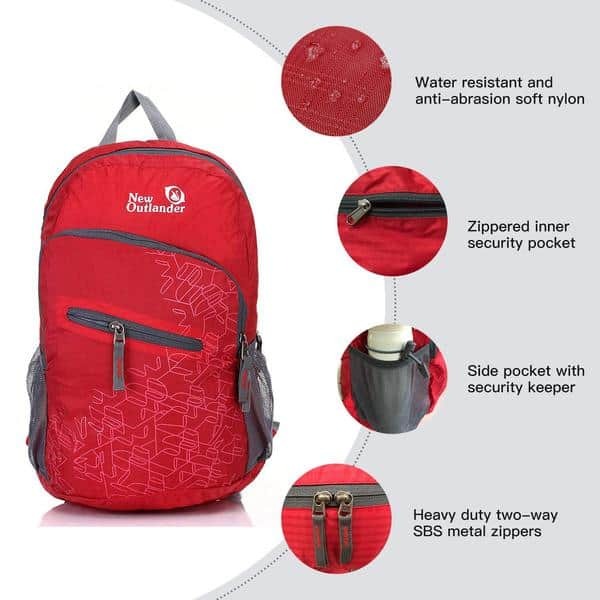 Apart from this, it also comes with a zippered front pocket for storage of credit cards, cash, and mobile phones, two side pockets with stretchable mesh fabric for storage of bottles, drinks, or umbrellas. The Outdoor Master Hiking Backpack is the first 50 liter variant on our list. Extremely durable and versatile, the Outdoor Master can be used for hiking, trekking, camping, and as carry-on luggage on long trips. The most significant feature of the Outdoor Master Hiking Backpack is the waterproof rain protector. This variant comes with a pocket that houses the rain cover. It also has a padded laptop compartment for people who cannot travel without their laptops and tablets. With plenty of room for all your essentials and equipment, the Outdoor Master is a definite must-have. It has external attachment points for small and large items and can hold a hydration reservoir, a tent, sleeping bags, trekking poles, and more. It has a foam padded hip belt to distribute weight with adjustable S-curved shoulder straps for added support. The Outdoor Master also has a reinforced haul handle and comes with plenty of pockets for easy storage and organizing. The Teton Sports Scout is excellent for hiking, camping, and backpacking. With a sewn-in rain cover, it promises complete coverage from wetness. It also features an adjustable waist belt to up to 60 inches making it a perfect fit for teenagers and adults. The torso length adjustable strap has a range of 15 inches to 19.5 inches. 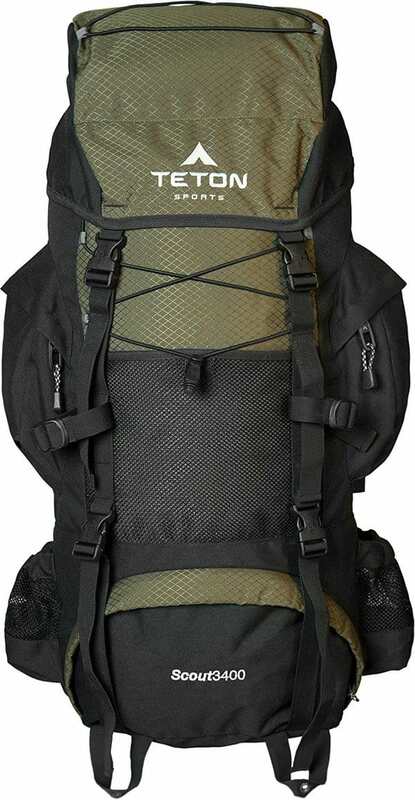 Not very heavy, this backpack is ideal for overnight camping trips extending up to 2 nights. 55 liters in capacity and weighing 4.5 pounds, the storage in this bag is incredible. 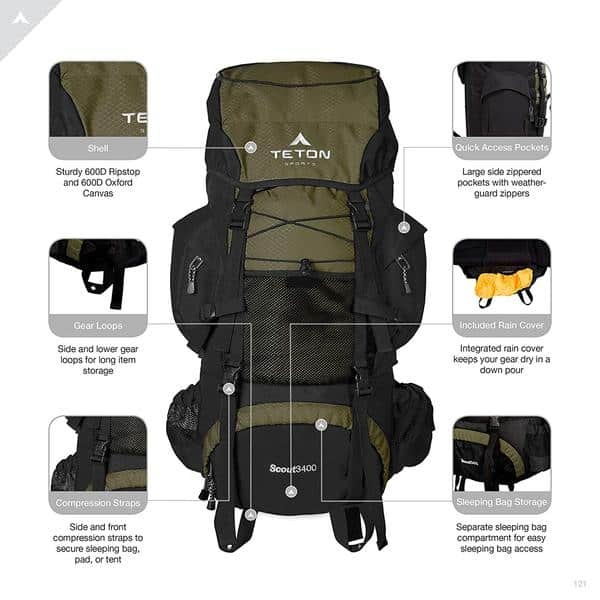 The Teton Sports Scout 3400 comes with an open-cell foam lumbar pad that molds the back to the backpack for ultimate comfort and fit while walking long distances. This lumbar feature also allows perfect airflow and helps in avoiding cramps, clammy and sweaty backs, and sores. Apart from these designs, the Scout 3400 also comes with a separate compartment for sleeping rolls or beds. 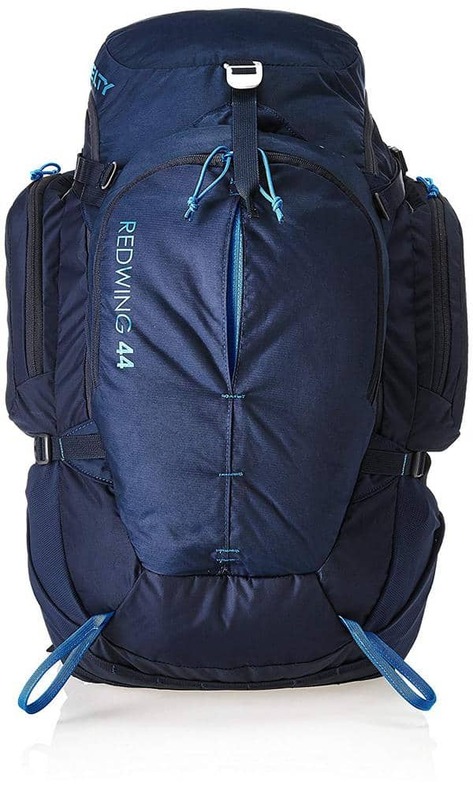 The Kelty Redwing 50 is a fantastic unisex backpack with great use on long-haul trips and camping. Ideal for urban and rural travel, the Redwing 50 is a sturdy and versatile backpack that features multiutility and multifunction pockets and zippers for greater functionality and organization. Kelty backpacks usually offer a supremely comfortable fit across the shoulders and back with equal distribution of weight. The Redwing 50 lives up to this claim and fits snugly to allow easy access to compartments. Some of the notable features of this variant include a Perfect-Fit suspension, internal HDPE frame sheet, side compression straps for ease of use, AirFlow back panel for long hauls, and plenty of pockets including top, front, side, and liquid or bottle spaces. The hybrid zipper U-design operates as a top-loader and panel-loader allowing easy access. The Kelty Redwing 50 also has an ergonomic design and lumbar pad for additional support. Another Kelty Redwing makes it to our list. The Redwing Backpack 44 is a hot seller for many reasons. It has advanced features, is super comfortable, and is durable in multi-weather. Another notable thing about the Kelty Redwing 44 is that it is not very expensive and is considered to be part of an affordable range. 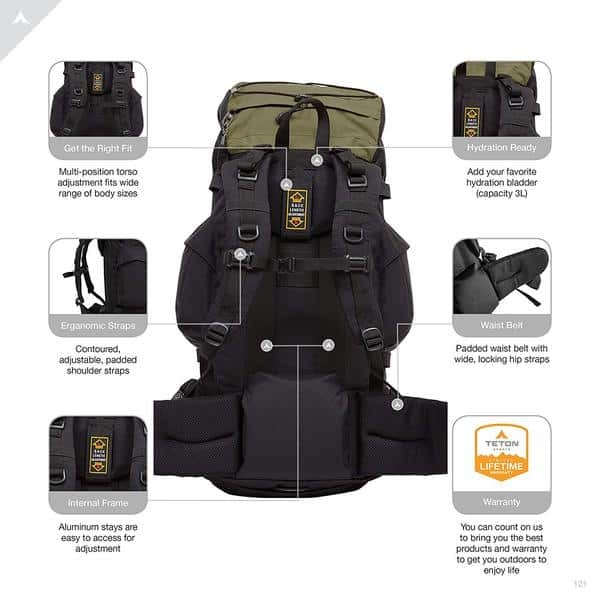 The features boast of adjustable well-padded shoulder straps, hip belts, and a sternum strap. The superiorly well-crafted back support with air vents allows ventilation for a Dynamic Airflow system at the back. The single aluminum LightBeam stay helps keep your back stable. The Redwing 44 is a panel loaded design for ease of access and organization. It also comes packed with external utilitarian pockets for ease of access. This version from Redwing is available in 44 liters and 50 liters making the selection process simple for men and women. 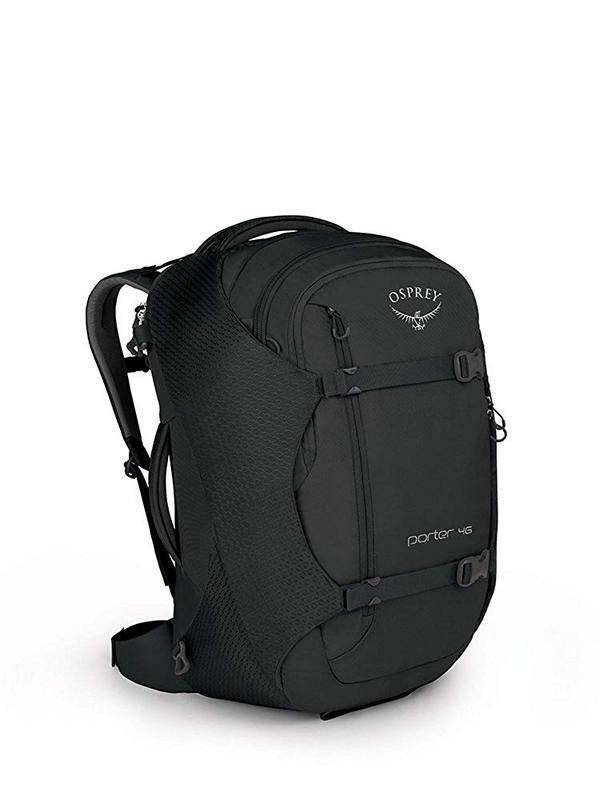 The Osprey Unisex Porter 46 is a fantastic daily travel or trekking backpack. Known for a duffel-bag type of style, the Osprey Porter 46 has solid padded walls that protect your clothes and equipment like cameras, laptops, and so on. These walls also help the backpack maintain shape and structure, thereby making it easier to pack and wear. 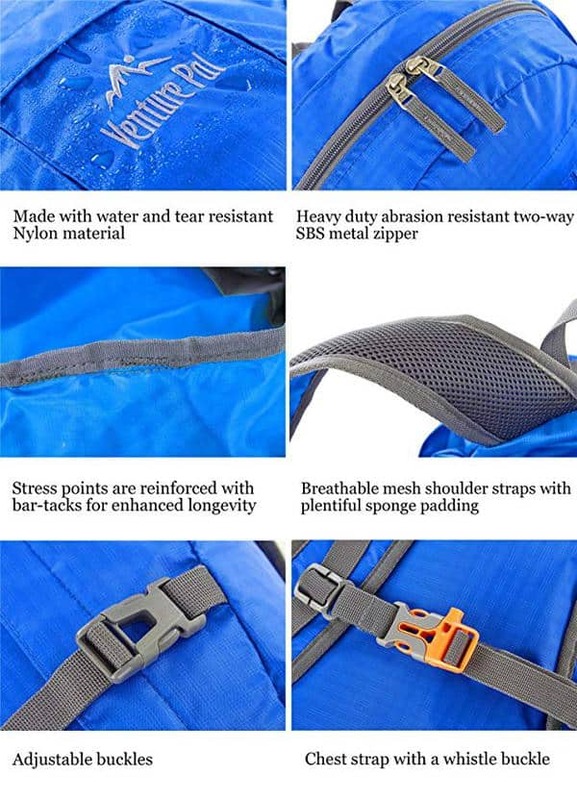 The harness is thinner than other backpacks but padded for support. Available in sizes of 30 liters, 46 liters, and 60 liters, this bag is carry-on compatible. It also comes with a dedicated laptop pocket and tablet sleeve. 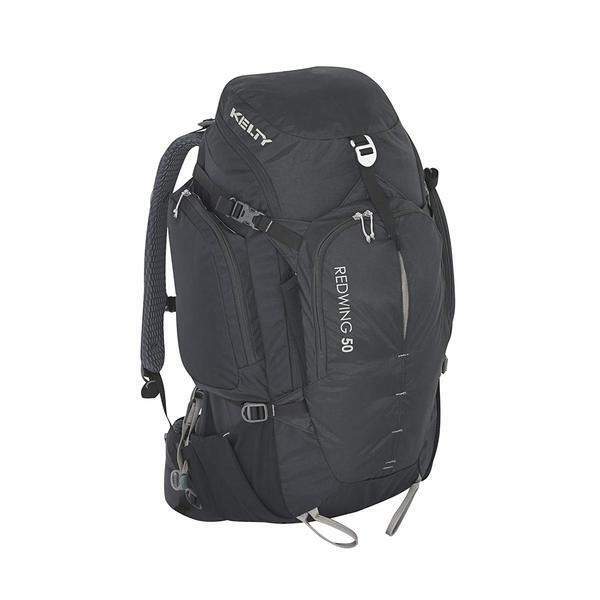 The Osprey Porter 46 has reinforced cord loops to attach other daypacks and hampers. 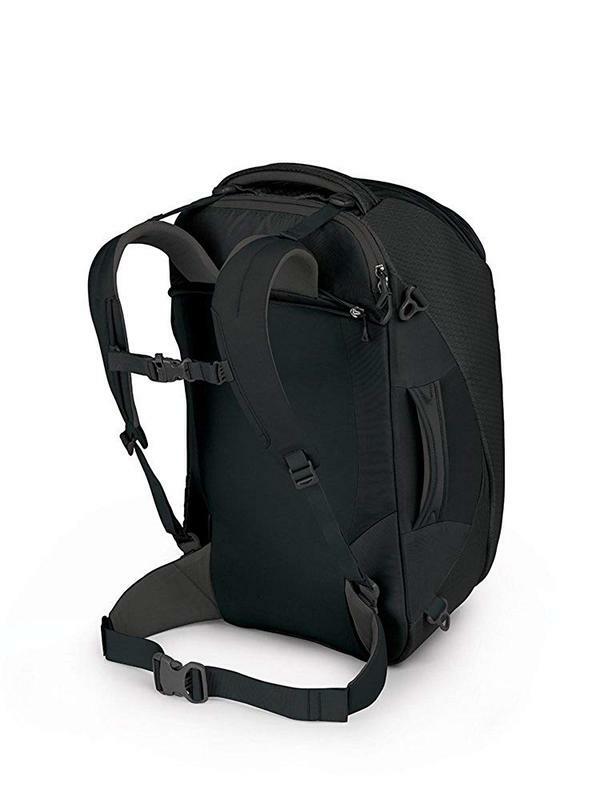 The larger compartment of the backpack has a lockable zip to the large panel in the pack for ease of organization. It also comes with a stowaway harness and a hip belt. A top pocket organizer provides quick access to toiletries and essentials. This version of the Osprey backpack series also has straitjacket protection to compress the sides and protect your contents. 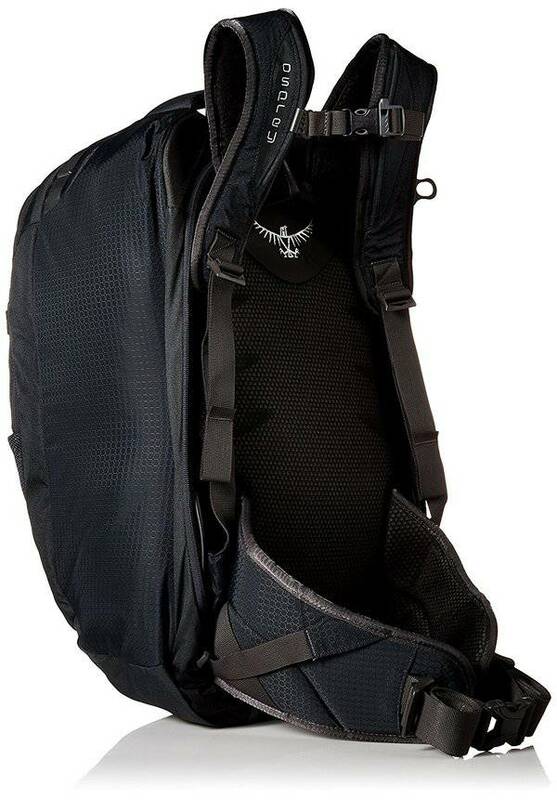 The Osprey Farpoint 40 is the last but not the least on our list. 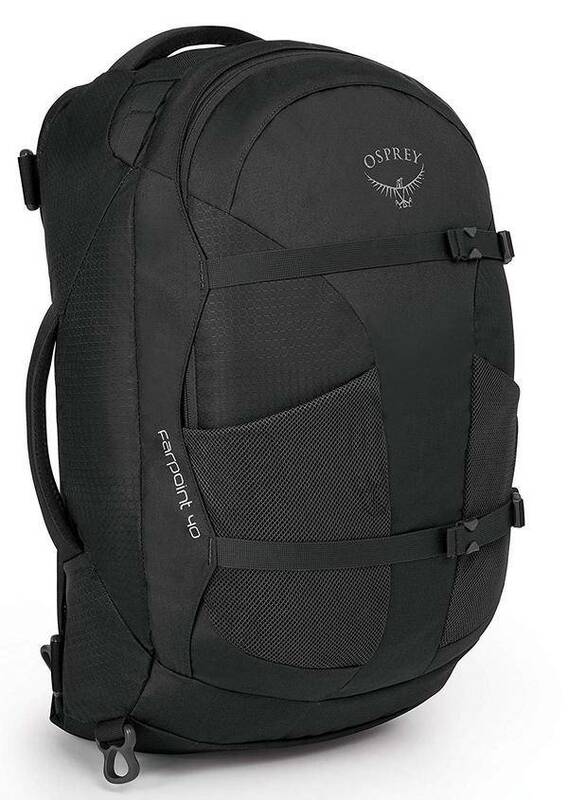 An excellent travel backpack, the lightweight structure and frame of this model from Osprey is suited to all jet-setters and travel enthusiasts. Built for a weekend getaway or a trek through the wilderness, the Farpoint 40 is constructed to meet the requirements of almost any airline carrier. The lightweight frame and harness help transfer the load of the bag from the shoulder to the hips to distribute weight more evenly. 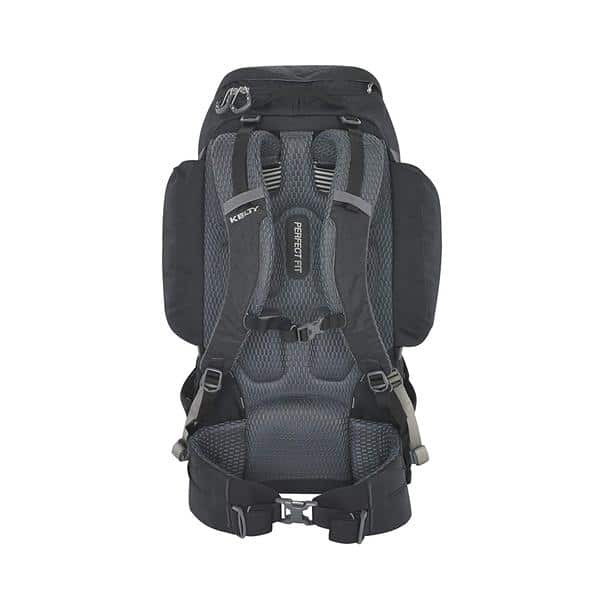 The Osprey Farpoint 40 also comes equipped with a back mesh structure that allows perfect ventilation and airflow and helps avoid hot and clingy backs. It also has well-padded adjustable shoulder straps and a full-sized hip belt for ease of movement. 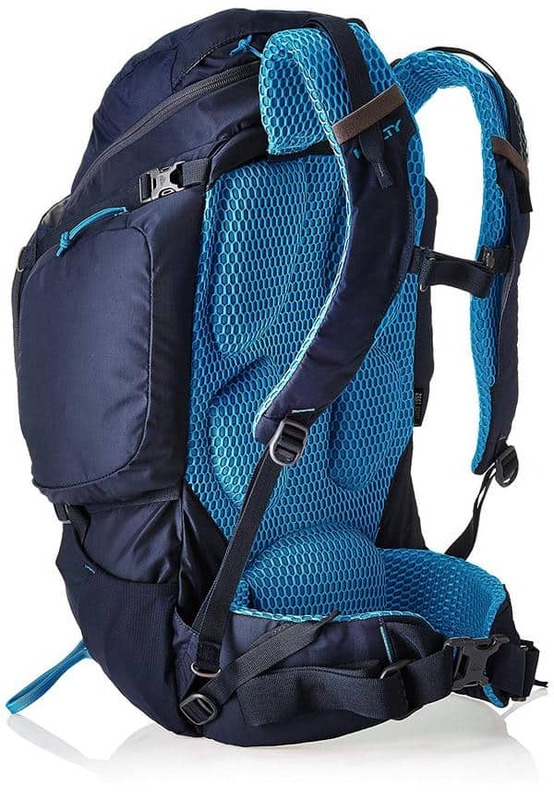 An excellent backpack for sportier and more adventurous people, the Osprey Farpoint 40 is great for backpacking and budget travels. It comes with a stowaway back panel, substantial internal storage, padded handles, and front compression straps.